Happy Saturday, friends! Today I have a recipe to share with you that I’m particularly excited about. Why, you ask? Because it involves buffalo sauce, of course!! Now, I wouldn’t go so far as to say that I love buffalo sauce the way that I do balsamic vinegar or lemon-anything, but it’s a pretty close second. Pretty much anything that I can find or think of to put it on, I will. And J loves it too, of course. 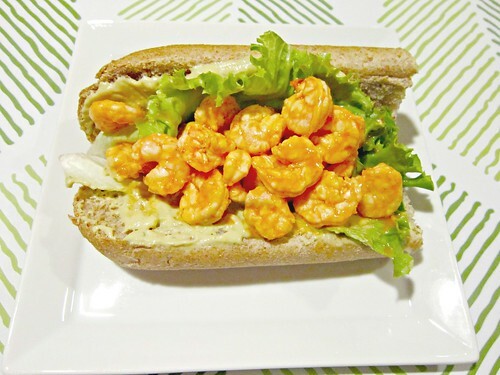 So, when I saw this buffalo shrimp sammich, I had to have it. And if you’re trying to watch your carbs, you could even ditch the bread and make a lettuce wrap of it. I love me some bread, so that’s not my first choice, but ya know…we all gots to watch our waistline in one way or another, so do what you need to do, but don’t miss out on the deliciousness! Place the shrimp in a medium size bowl with 2 tablespoons of the buffalo sauce and the olive oil. Toss to coat well. Set aside and reserve the remaining sauce. In a food processor, combine the avocado, Greek yogurt, parsley, dill, paprika, onion powder, garlic, Worcestershire, white vinegar, and hot sauce. Blend until creamy, stopping to scrape the sides as necessary. Taste and season with salt and pepper, to taste. Scrape into a bowl if desired and set aside. Heat a skillet or grill pan over high heat. Add shrimp and cook for 1-2 minutes per side, until pink and cooked through. Remove from the skillet and toss with a few tablespoons of the remaining sauce, but leave enough to drizzle on the sammiches. Meanwhile, preheat your broiler. Cut your baguette into sandwich size pieces, the slice in half lengthwise so you have the top and bottom “bun” and place on a baking sheet. Broil for just a couple of minutes until slightly browned around the edges and a little crisp. Be careful not to burn them! Remove from the oven and assemble sammiches. Spread the spicy avocado ranch evenly across the bottom of each baguette. Top with lettuce, a sprinkle of blue cheese and a drizzle of buffalo sauce. Layer shrimp on top and top with more blue cheese and buffalo sauce if you’d like, then the top bun, and devour!